This is another BBC Good Food recipe, but I adapted it very slightly. It’s really lovely and flavourful, very filling and incredibly easy to make. Plus it only uses one pot/saucepan, which is always a bonus. It’s a warm-but-not-hot, tomatoey, chicken, yummy, satisfying and healthy recipe which went down extremely well with my parents. My mother immediately called dibs on the leftovers for her lunch the next day, which is a good sign. This one is definitely in the Make Again pile. Get a large frying pan with a lid that fits well. This bit is important; I’ll explain why later. Then chop the chicken into chunks and fry it in the pan with some Fry Light until it’s brown, which should take about 5-8 minutes. 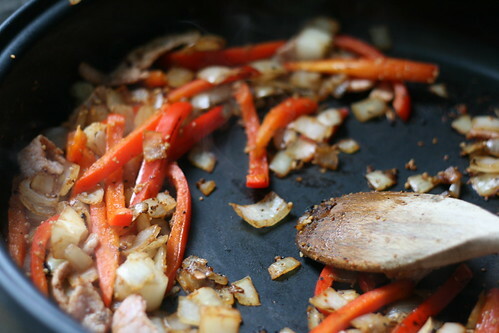 Whilst it’s cooking, dice the onion and thinly slice the red pepper. Remove all the fat from the bacon and cut it into strips. 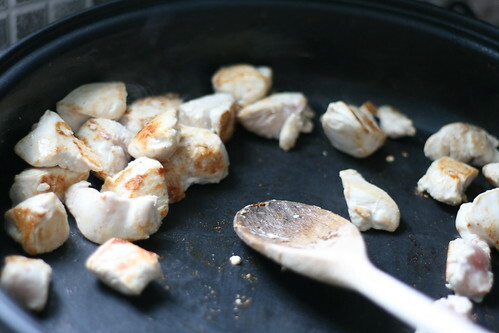 Then take the chicken back out of the pan and set it aside. Cook the onion for 3-4 minutes until it’s softened, before adding the sliced pepper, crushed garlic, bacon and a tablespoon or so of the Cajun spice. Cook it for another five minutes. 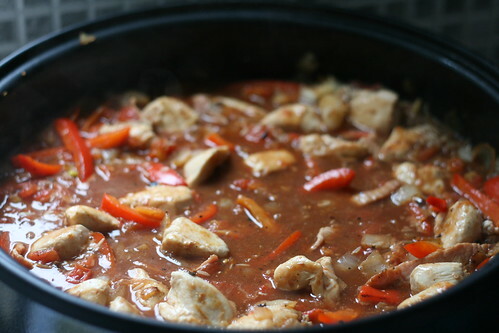 Then stir the chicken back in and tip in the wholemeal rice, the tomatoes and the stock. This is where the lid bit is important. You need to cover the pan and simmer the mix for 20-25 minutes, until the rice is cooked. My lid didn’t fit properly so all the water kept evaporating and escaping — I had to pour in stock twice more. Whilst this wasn’t too much of a problem, it was a bit of a pain. Anyway, once that’s all done and most of the liquid has been absorbed/bubbled away, serve it with some green veg and voila! A tasty, easy, extremely satisfying meal.